We are already beyond the upper temperature tolerance for coral reef ecosystems, and they can stand no further warming. Coral reef ecosystems will soon vanish unless atmospheric CO2 concentrations are rapidly reduced to pre-industrial levels. Most corals in the world died from heat shock after the 1980s, when the world passed the tipping point temperature threshold for mass coral bleaching. Global warming heat waves are now killing corals so rapidly that 95-99% of corals (some thousands of years old) in pristine reefs can die in just days or weeks. Further warming will be a death sentence for coral reefs, the most biodiverse and productive of marine ecosystems. The press widely reports “scientists agree that 2º C, or 1.5º C warming is acceptable”, ignoring the ecological disaster that has already happened, and tacitly condemning coral reefs to death as the first ecosystem to be driven to extinction from fossil fuel greenhouse gas (GHG) caused global warming. This will severely damage marine biodiversity, fisheries, tourism, shore protection, and beach sand supply of over 100 countries, and sentence billions of people to lose their homes from future coastal flooding. Coral reef bleaching is long known to be a general response to environmental stresses, but almost all coral bleaching is caused by high temperature heat shock. Temperatures above normal body temperature (37˚C) trigger human heat stress responses. Muscle cramps and excessive sweating are symptoms. If not relieved, heat exhaustion, and then heat stroke follow. Untreated heat stroke leads to failure of physiological mechanisms and death. Similarly, heat-shocked bleached coral (typically in water temperatures above 29.4˚C), is unable to defend itself against thermal stress. Coral reef bleaching, when symbiotic algae and host tissues dissociate, can be reversed if stress is quickly relieved. But any further rise in temperature or prolonged heat exposure leads irreversibly to death. Coral bleaching has been known for a hundred years, but until the 1980s, it was only seen on small scales in tide pools cut off from water circulation at low tide, or in response to hurricane sediment and fresh water flooding. In 1918, and again in 1928, it was found that only around 1o C warming caused coral bleaching, and a little more killed them. These limits have not changed. When the first mass regional bleaching events took place in 1982-1983, almost all corals in the East Pacific (Panama, Costa Rica, Colombia, and Galapagos) died. Peter Glynn, who that year published the first book on Galapagos and East Pacific corals, studied every possible potential cause, and found only high temperature could explain it. Many thought that this was simply some peculiar regional coral sensitivity, because if all corals were really so close to their upper limit, why hadn’t it happened before due to natural fluctuations? Within a few years mass coral reef bleaching across the Caribbean, Pacific, and Indian Oceans made it clear that the global temperature tipping point world-wide had been suddenly passed in the 1980s. Goreau and Hayes proposed the HotSpot method for predicting mass coral reef bleaching events from satellite sea surface temperature data (SST) in the late 1980s. They, Ernest Williams, Lucy Bunkley- Williams, and Peter Glynn pointed out that there had been NO regional mass coral bleaching events ever seen anywhere before 1982, but mass bleaching suddenly began and happened worldwide nearly every year since. They emphasized that continued warming would destroy coral reef ecosystems. Unfortunately, their predictions, widely ridiculed as alarmist at the time, have come true. Governments ignored scientific evidence of global warming, claiming that reefs were “resilient” and would “bounce right back”, funding research to blame anything else and those telling them what they wanted to hear. The temperature thresholds for mass coral bleaching determined in the 1980s have not changed since. Bleaching events have gotten worse and more frequent, so dive shops now regard them as “normal” and no longer report bleaching, because it is “bad for business”. There has been no sign of thermal adaptation, corals still bleach at the same temperatures, but every year there are less left to bleach. Reef ecosystem function, structure, and biodiversity are collapsing, resulting in reefs with only a few species of “weedy” corals left. These can stand slightly higher temperatures, but even their limits are now being exceeded, and more frequently with further global warming, so they too will vanish. Even corals that have luckily survived bleaching events have been badly weakened by worldwide outbreaks of new coral diseases, which intensify during high temperature events, and often follow beaching events. For coral reefs to survive global warming must be rapidly reversed. In 1992, before the UN Framework Convention on Climate Change was signed in Rio de Janeiro, the Global Coral Reef Alliance (GCRA) warned Ambassadors of the Association of Small Island States that agreeing to further increases in temperature was a suicide pact, that if prompt and deliberate measures were not taken to stop global warming right away most of the corals in the world would die from high temperature in the next 20 years. That is exactly what has happened. Yet governments and funding agencies continue to ignore that coral reefs are the most sensitive and vulnerable of all ecosystems to high temperature and pollution, wasting millions on propaganda about “managing” “resilient” reefs, instead of dealing with the root causes: GHGs from fossil fuels and land degradation. Ocean acidification was understood long before the 1970s. Acidification is already a problem for cold and deep-water life, but NOT yet for tropical marine ecosystems. Because of the inverse relation between CO2 solubility and temperature, polar water holds three times more CO2 than equatorial water. Acidification is not a factor in death of corals, which recover from it. Corals are already dying worldwide at current temperatures but every press article about ocean acidification shows photographs of corals bleached by high temperatures, even though acidification neither kills corals nor does it bleach them! Skeletons of living corals can be completely dissolved in acid, but the coral tissue retains its color, and will survive and grow a new skeleton when put in normal seawater. Corals will need to use more energy to grow skeletons in acidic seawater, but acidification is not the existential threat to tropical coral survival widely and incorrectly claimed, although it is a real threat to deep sea cold water reefs. Ignoring the fact that coral reefs are already at their upper-temperature limit, and focusing on acidification problems for tropical coral reefs is a dangerously irresponsible and politically-motivated red herring. If CO2 is reduced in time to stop global warming from killing corals all global acidification problems are automatically solved. But focusing only on stopping acidification impacts on reefs guarantees corals will die sooner from heat stroke, and decades to centuries later the reefs made of their long-dead skeletons will eventually dissolve! An author of this paper (TG) was Senior Scientific Affairs Officer for Global Climate Change and Biodiversity at the United Nations Centre for Science and Technology for Development in 1989 when the first draft of the UNFCCC was being prepared, prior to its distribution to governments. He inserted into the draft that one of the purposes of the Convention was to protect Earth’s most climatically-sensitive ecosystems, that these should be monitored for signs of dangerous climate change impacts, that there should be a trigger mechanism to reduce GHG emissions if climate damage was found, and that ALL GHG sources and sinks should be monitored. To force a politically acceptable compromise, all wording making these points were removed and replaced with vague subjective phrases like “acceptable warming.” The result of this fudged compromise is the perilous deterioration that ice caps and coral reefs have now reached. Governments who made this compromise failed their basic duty to protect their people, with the small island nations being the first and worst victims. This failure must not be repeated. Governments are fooling themselves about how severe runaway climate change will be and how long it will last. IPCC projections focus on short-term responses over decades to centuries, ignoring long-term effects. The consequences are well known to climate scientists, but were not included because IPCC’s mandate from Governments reflects political needs, not scientific priorities. The inertia of the climate system inevitably caused by the fact that it takes 1500 years for the ocean to mix is ignored. Since deep ocean waters has been chilled by polar ice caps and are now just above freezing, until the deep sea warms up the full warming will not be felt at Earth’s surface. Heat is flowing down into the deep cold ocean, but surface temperatures have a built-in time lag response of thousands of years after atmosphere GHGs increase. Sea level has even longer time lags due to slow melting of the polar ice caps, which will continue for thousands of years, but there could be sudden increases under extreme warming when whole glaciers, lubricated underneath by meltwater, slide into the sea. Three rapid increases of 6.5, 7.5, and 13.5 meters are documented in fossil coral reefs during rapid ice melting at the end of the last Ice Age. Nearly a million years of climate data from Antarctic ice cores clearly show that present atmospheric CO2 concentration of 400 ppm could lead to ultimate steady-state response of global temperatures around 17 C higher than now, and sea levels around 23 meters higher, many times more than IPCCC’s projections (see the data figures below). These effects will persist for hundreds of thousands of years unless GHG concentrations are rapidly reduced to pre-industrial levels. Eventually high temperatures and rotting marine life will remove oxygen from the water, turning the ocean into a dead zone, stinking with the rotten egg smell of hydrogen sulfide. Organic matter will then pile up in deep ocean sediments, eventually removing the excess CO2 from the atmosphere. Every time this happened in the geological past, coral reef ecosystems went extinct for millions of years until new reef-building corals could evolve. To avoid the inevitable long-term impacts of runaway climate change we must urgently take scientifically-sound action to reduce GHGs to pre-industrial levels now. CO2, temperature, and sea level over the last 800,000 years from Antarctic Ice cores suggest the steady state temperature and sea level for today’s CO2 is 17 Celsius and 23 meters higher. 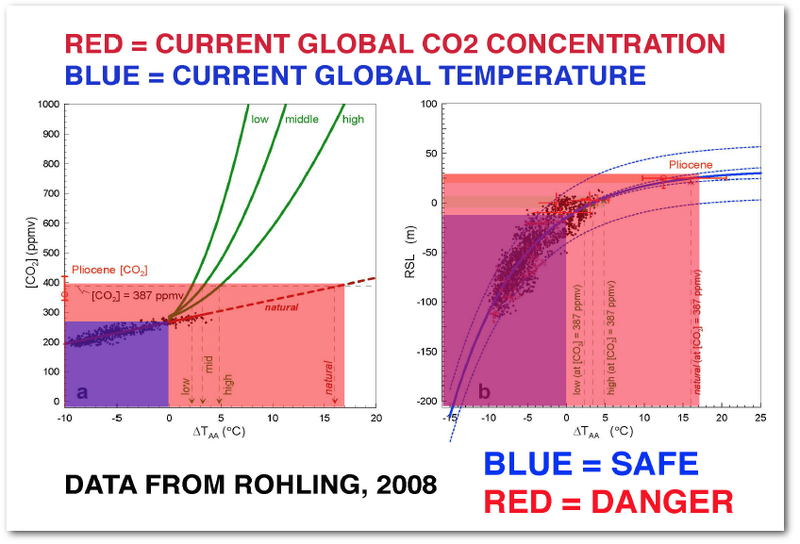 Data from Rohling (2008), annotated by Goreau (2014). Scientifically-sound solutions to save coral reefs are well established but are not being used on the scale needed, due to lack of funding. It has been known for more than 200 years that corals can be propagated by fragmentation, and that these methods only work when water quality is excellent. All the corals die when the water becomes too hot, muddy, or polluted. The only methods that will work in the future to maintain coral populations, while temperature and pollution are accelerating globally, are new methods that greatly increase coral settlement, growth, survival, and resistance to stress. Because it directly stimulates the natural energy-generating mechanisms of all forms of life, GCRA’s Biorock electrical reef regeneration technology is the only method known that can grow Coral Arks to save species from extinction. Other coral restoration methods work only as long as it never gets too hot, muddy, or polluted, but the corals die from heat stroke when their temperature limits are exceeded, while most Biorock reef corals survive. The Biorock method keeps entire reefs alive when they would die, providing high coral survival when 95-99% of surrounding reef corals bleach and die from heat shock. It also grows back dead reefs and severely eroded beaches at record rates in places where there has been no natural recovery. Since there is no funding for serious reef restoration or shore protection anywhere in the world it is now being used only on a symbolic scale. The method uses Safe Extremely Low Voltage (SELV) direct current (DC) trickle charges that can be provided by energy of the sun, winds, waves, and ocean currents. It works for all marine ecosystems, coral reefs, oyster and mussel reefs, fisheries habitat, seagrasses, salt marshes, and mangroves. Severely eroded beaches recovered naturally just months after wave-resistant limestone reefs were grown in front of them. Because these reefs can be grown in any size or shape, increase growth and survival of all marine organisms, and since habitat can be designed for specific needs of different fish and shellfish, they provide a new paradigm for highly productive and sustainable multi-species mariculture of entire complex ecosystems that produce their own food. Further human-caused warming tragically means that coral reefs may only survive in the long run on electrical life-support systems until GHGs and temperatures are reduced to near pre-industrial levels, but this is the only interim alternative remaining to preserve the world’s most valuable economic and environmental ecosystem services until pre-industrial GHG levels can be achieved. Nearly 60% of all global ecosystem service economic losses are from coral reef degradation. Reefs occupy less than 0.1% of the ocean so they suffer natural ecosystem service economic losses around a thousand times the global average. This is largely borne by small island nations, the first and worst victims of a crisis they did not create. Unfortunately, only reefs that can be powered can be saved, but if we don’t save all we can, these may be all we have left, so Biorock Coral Arks need to be greatly expanded to save species. Around 80% of all genera and nearly half the species of tropical reef corals are growing on around 500 Biorock reefs in some 40 countries, around 400 reefs in Indonesia, with the world’s largest and most biodiverse coral reefs. The long-term solutions are also known. Humanity must regenerate the natural biological mechanisms that regulate atmospheric GHGs and climate by storing excess atmospheric carbon in soils and vegetation. Humans have destroyed about half the world’s biomass and lost about half the soil carbon wherever forests have been converted to agriculture, pastures, and cities. Regenerating soil carbon is the most cost-effective way to stabilize climate at safe levels, avoid dangerous long-term temperature overshoot, and regenerate food supplies and freshwater resources. This could be done in decades if Geotherapy methods already developed to regenerate ecosystems and soil fertility were more widely applied. Soils have around five times more carbon than the atmosphere, and soil carbon can be rapidly increased through regenerative carbon recycling management, including use of biochar, an ancient technology invented by Indigenous Amazonian peoples thousands of years ago to create the world’s most fertile soils in the middle of the most infertile soils on Earth. Properly made biochar lasts holds carbon for thousands of years. Charcoal from forest fires 65 million years ago after the asteroid impact that killed the dinosaurs, and even as far back as 350 million years ago, are still so perfectly preserved that the plant cells can be clearly seen. Biochar is best made from invasive weedy plants that have made large areas unproductive, converting wasted lands back into biodiverse, highly productive systems that hold far more carbon. About half of soil carbon is stored in wetlands, and half that in coastal wetlands; mangroves, salt marshes, and seagrasses, whose soils hold more carbon than the atmosphere, and are responsible for about half the carbon burial in the oceans. These ecosystems, the most carbon-rich, occupy less than a percent of the Earth’s surface, and have been about half destroyed by humans. Restoring mangroves will be the fastest and cheapest way to remove carbon from the atmosphere. Most mangrove, seagrass, and salt marsh restoration projects fail as plants wash away before the roots can grow, because of increasing waves due to global sea level rise and global warming. Biorock electrical ecosystem restoration technology grows marine plant roots at much faster rates, and stores more carbon in marine soils, so it regenerates carbon-rich marine coastal ecosystems where other methods fail, protecting coasts from erosion, and regenerating critical juvenile fisheries habitat. GCRA, Biorock Indonesia, and Arsari Enviro Industri will apply these methods to restore destroyed mangroves in Kalimantan (Borneo) in order to turn intense carbon sources into sinks, and for orangutan sanctuaries. Last year, El Niño- caused forest fires burned organic peat soils in deforested and drained wetlands, briefly making Indonesia the world’s largest CO2 source, larger than China or the United States. Indonesia has the world’s largest mangrove and coral reef areas, but more than half the mangroves have been destroyed, and more than 90% of the reefs are damaged or degraded. By regenerating mangroves, coral reefs, fisheries, seagrasses, and beaches with Biorock technology Indonesia could become the world’s largest Carbon sink. Geotherapy must be clearly distinguished from Geoengineering. Geotherapy is regenerative development to reverse climate change by restoring the natural carbon recycling mechanisms that regulate our planetary life support systems. Many Geoengineering proposals are expensive, unproven, high tech “solutions” that might provide temporary relief at best, but may cause worse problems and side-effects than the problems they claim to solve. Geotherapy has nothing in common with proposals masquerading as “green” solutions to climate change like Biomass Energy with Carbon Capture and Sequestration (BECCS). BECCS proposes to grow huge plantations of mono-species forests on industrial scales (competing with food production), burn them for energy, and pump the CO2 into holes in the ground, which could cause earthquakes by over-pressuring faults. BECCS irresponsibly treats carbon as waste to be concealed rather than as a valuable natural resource. BECCS will prevent natural carbon and biological nutrient recycling and storage, along with all the long-term Geotherapy benefits that increased soil carbon provides for food and fresh water supplies. Urgent worldwide application of methods to regenerate natural soil carbon and soil fertility are our best hope to reduce GHGs, stabilize them at safe pre-industrial levels, prevent temperature overshoot, and reverse climate change. Immediate global action to apply these methods on a large scale is essential to do this in time to prevent coral reef extinction. Governments must rapidly change course for this to happen. 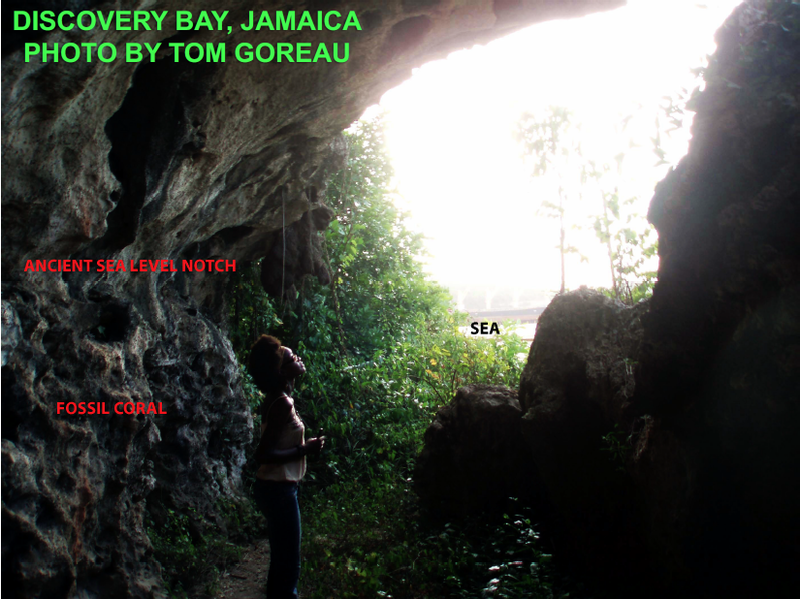 The authors are coral scientists with roots in Jamaica, Panama, Cuba, Martinique, and Puerto Rico who have worked on reefs worldwide for more than 5 decades. They thank the pioneers of coral bleaching research, Maurice Yonge, Thomas F. Goreau, Nora Goreau, Robert Trench, and Peter Glynn for their long guidance, and Kevin Lister and Michael MacCracken for helpful suggestions on the draft.